Bella & Bambino: Grayson's Coming to Bella's! Grayson is coming to spend the week with Bella & Papa Asa. We are so excited! Grayson is old enough to attend Vacation Bible School this year so he and I will go every evening. He is going to have such a great time at VBS because his teachers are the most wonderful ladies who love working with little folks. 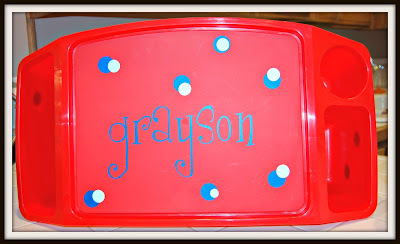 Of course we will not spoil him one bit, but if he happens to want to eat while watching TV I personalized a bright red lap tray for him :) He can color or eat on his tray. I used polka dots and "Girls Are Weird" font for his name. I also made Little GrayMan a personalized tote for all of his cars, books, Legos or whatever he wants to put in there. Once again I used "Girls Are Weird" font and added stars. I used my Cricut and vinyl to personalize these things. 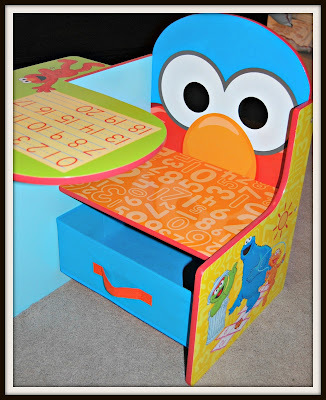 I saw this adorable activity chair on Pinterest and then found it online at WalMart. I had it delivered to our store....so easy to do. Thank you WalMart for making it so easy to order online. (However, it took me over an hour to put it together) Won't he be soooo cute sitting in it and drawing a picture or coloring? Ok, ok enough of being a typical grandmother....sorry. 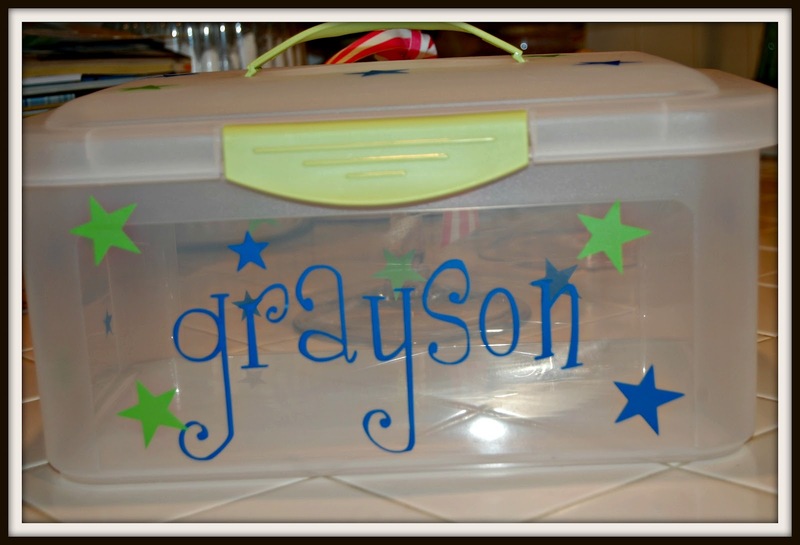 I just love all of your personalized items! You said you cut vinyl with your Circut machine. Are the fonts you use Circut cartridges or were you one of the lucky ones who purchased Sure Cuts A Lot 2 before Cricut took them to court? I have a Circut but don't seem to find cartridges with really cut fonts. Thank you so much Janie. Yes I was fortunate to buy sure cuts a lot before all the legal stuff started. I think silhouette has software. I would encourage anyone to purchase a silhouette if they don't already have a cricut because of the software that is available. The software allows you to do so much more than just the cartridges. Thanks, Karen. I have a Cricut and am so disappointed with the cartridges that I am going to check into a Silhouette.